Saudi Arabia discusses deploying as many as 150,000 troops and 100 warplanes in operation receiving coordination from the Pentagon and supported by Egypt, Morocco, Jordan, Sudan, Kuwait, the United Arab Emirates, Qatar and Bahrain. Airstrikes led by Saudi Arabia, and supported by other members of Gulf Cooperating Council and the U.S. government, continued to hit Yemen on Thursday as the situation in one of the world’s most impoverished, yet strategically important countries continues to unravel amid what can only be described now as all-out war. 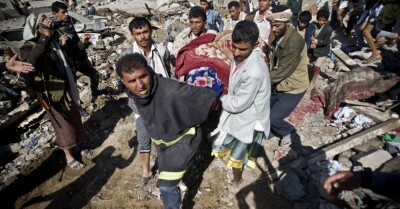 Reports indicates that a first wave of bombings overnight which resulted in a number of civilian deaths—including entire families trapped in flattened houses—have spurred widespread anger in Sanaa and other targeted cities, even among members of the population opposed to the Houthi rebels who have now wrested control of much of the country from President Abd-Rabbu Mansour Hadi, whose whereabouts remain hard to establish. The White House, reports Reuters, has said it is actively supporting the operation and President Obama has authorized U.S. “logistical and intelligence support” for the bombing campaign. However, according National Security Council spokeswoman, U.S. forces are not involved in direct military action in Yemen. The Houthi-controlled ministry of health said that at least 18 civilians were killed and 24 were injured after airstrikes pummeled the capital city of Sanaa. According to Al-Jazeera English, strikes were also reported on targets in the Malaheez and Hafr Sufyan regions of Saada province, a main Houthi stronghold on the border with Saudi Arabia. [Houthi leaders] were calling on their supporters to protest in the streets of Sanaa on Thursday afternoon, Yemen’s Houthi-controlled state news agency SABA reported. TV stations affiliated with the rebels and their ally, former President Ali Abdullah Saleh, showed the aftermath of the strikes Thursday morning in what appeared to be a residential area. Al-Masirah TV, affiliated with the Houthis, quoted the ministry of health as saying that 18 civilians were killed and 24 were injured. Yemen Today, a TV station affiliated with Saleh, showed hundreds of residents congregating around a number of flattened houses, some chanting “Death to Al-Saud”, in reference to the kingdom’s royal family. The civilians were sifting through the rubble, pulling out mattresses, bricks and shrapnel. An Associated Press reporter on the scene in the Sanaa neighborhood near the international airport saw people searching for loved ones in the debris of flattened homes. Residents said at least three bodies were pulled from the rubble. There were traces of blood between the bricks. Ahmed al-Sumaini said an entire alley close to the airport was wiped out in the strikes overnight. He said people ran out from their homes in the middle of the night. “This was a surprise. I was asleep and I was jolted out of my bed,” he said, waving a piece of shrapnel. Speaking to Al Jazeera from Sanaa, Houthi spokesman Mohammed Al Bukhaiti called the military action a declaration of war on Yemen, adding that reports alledging that Houthi leader Mohamed Ali Al Houthi had been injured were false. Meanwhile, Iran’s Foreign Minister Mohammad Javad Zarif demanded an immediate halt to the airstrikes which he called a form of “US-backed aggression” which would only make matters worse in the region. “Military action from outside of Yemen against its territorial integrity and its people will have no other result than more bloodshed and more deaths,” Zarif told the state-owned Al-Alam television station.